Per the Motion Picture Association of America, more than 200 movies and television series are filmed in New York State each year. One of the joys of living in New York is getting to see our fair city often on screens both large and small (Conversely, one of the downsides of living in New York is is having to deal with film sets closing off various sidewalks). Even though New York is arguably the greatest city in the world, some filmmakers feel the need to take a little creative license with their portrayals of the city, giving us, what I like to call, Fictional New York. Let’s start with the entrance: I have never seen a subway entrance with an awning like that; in fact, there are very few covered subway entrances at all. Most are simple stairways with a bit of fencing, usually near the corner of the street. You will occasionally see entrances on the sides of buildings (similar to the one in the picture), but the signs are very discreet, a simple sign above the entrance. To me, it looks like they took the existing awning of the building and wrapped it in MTA branding, which makes me wonder, “Why did they make the effort to do so?”. Now, to the contents of the sign: To most people walking around New York today, “K train” probably sounds more like a reference to recreational use of ketamine than something run by the MTA. But they would be mistaken! From 1985 to 1988, there was a K Train; it ran local on the Eighth Avenue line. It also did not have a 57th street stop; nor did it go to Brooklyn (Watson and Holmes’ burrough, where they were in the previous scene). If you live in New York, you likely know that the Eighth Avenue line (A/C/E) signs are a dark blue, much darker than this K Train sign. That shade of robin’s egg blue is closer to the color of the yet-to-be-completed Second Avenue Subway. 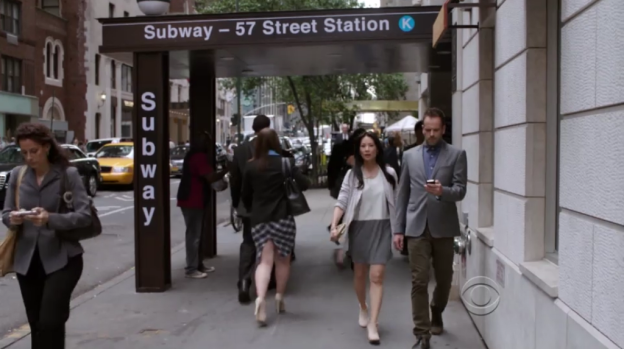 With all of the existing subway lines, why did the show feel the need to create their own?